-Hans Camenzind, inventor of the 555 timer (the world's most successful integrated circuit). -Tom Igoe, author of Physical Computing and Making Things Talk. -Kevin Kelly, in Cool Tools. You begin by blowing a fuse or burning out an LED to demonstrate voltage, amperage, and electrical resistance. As it says on the cover, "Burn things out, mess things up-that's how you learn!" 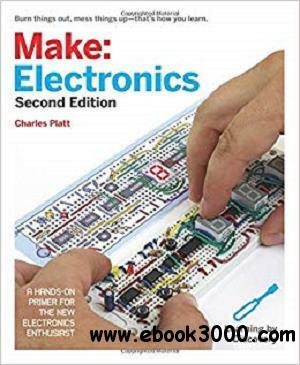 While Make: Electronics?minimizes the amount of theory that you need, it does show you how to figure out Ohm's Law and do the simple math to calculate the time constant of a capacitor.